Chris Ashford has had an outstanding season, read more about it here. However, now we want to get to grips with who Chris really is and what were some of the defining factors for this year. In this article both Chris and his coach Philip talk openly about the season and provide some useful insights to both sides of the coaching relationship. What do you think was the defining point in your 2017 season? 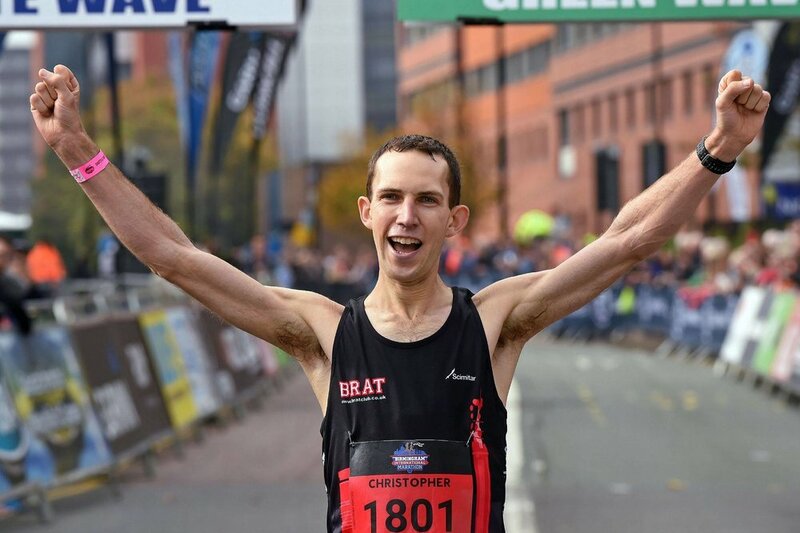 Chris: Achieving my 2017 “A” goal of a sub 2:30 marathon was the definitely a defining point. Coming at the tail end of the season, the whole of summer had been built towards looking for opportunities to improve in both training and lifestyle and expanding on areas such as sports nutrition and sports psychology. What I hadn’t realised, was that my second defining point would actually come less than 7 days later when I won my first marathon in Birmingham. A surprise both to me and to everyone else in the race! Philip: As a coach, I certainly concur with what Chris is saying as objective outcomes for the season. However, I would contest the fact it was a surprise that he won at Birmingham – he was in great shape, good form and probably could have gone faster. It may have been a surprise that he took the ribbon, but he ran a great race of the back of a strong season. That said as a coach, the most significant defining point for me took place a couple of weeks before Chester when he had finished a session with Mark [Bellamy]. His attitude, self belief and motivation had change (for the positive). So if I was to select one defining point, it would be that one. You started working with a nutritionist, Helen Money, (The Bosworth Clinic) what made you do that? Chris: Moving into 2017 I wanted to become a “complete athlete”. For me there are four elements of athletic success: 1) Training 2) Rest and Recovery 3) Nutrition 4) Mental Edge. Working with Phil I on the first two, but for the third and fourth I were improvement areas. I knew, or thought I knew what good nutrition looked like, but wanted advice on my current nutrition, both day to day, as well as race specific. Philip: I agree. I love nutrition (my waist line will testify to that!). However, my levels of understanding only go so far. Given the seriousness of Chris' goals, working with a professional like Helen allows both the coach and athlete to focus on training and performance. This was certainly Chris' motivation though. With respect to the nutrition side of things, what big changes did you make? Chris: Eating more! I was surprised when Helen told me how much of a calorie deficit I was in. Tracking my meals on MyFitnessPal gave Helen baseline data of food and timings. Helen encouraged me to focus on pre-training snacks as well as post training recovery. I had always trained in the morning fasted, but actually started getting up a bit earlier to have a couple of slices of toast to fuel the morning runs. It wasn’t a huge difference in time taken, but gave me some extra calories for the training volume required. Philip: I think we were all surprised. Here was a man performing almost 2:30 marathons, ultra marathons, training like crazy yet performing on the fumes. Mark [Bellamy], Helen [Money], Chris and I all sat round the table and discussed where the best areas were to maximise a return of investment. I guess "eating more" may not sound scientific, but when you started to delve into the numbers, it certainly made our job easy. This fuelled athlete could withstand a greater training load, intensity and generally recover well. It was remarkable! The obvious point, I always raised with Chris was that since working with Helen and Mark, Chris has the longest period of training without any niggles, real fatigue or injury. Conveniently, this took place in the lead up to his A-race! Psychology is an interesting area of sport, often overlooked. What did you hope to get out of starting to work with a psychologist? Chris: Working with Mark [The Bosworth Clinic], I wanted to understand about how to develop mental toughness for both training and racing. I never really thought of myself as being focused and dedicated, but discussions with Mark highlighted how strong I was already when it came to training. Mark showed me how I could transfer this to race focus, Mark helped me put the reality of the training completed, to think about the race just as execution of all the hard work. Philip: As I mentioned before, one of these sessions was the defining point in Chris' season. I really believe that. Chris had many of the tools already as a great athlete however, occasionally and conversely this worked as a detriment to his performance. In many ways be realigning Chris's attitude, beliefs and thoughts about what he already knew, Mark was able to make signifiant changes. How close did that aim end up being to the reality? Chris: Some of the changes were just small adjustments in my outlook. Missed sessions (due to work commitments) were re-framed as increased rest, rather than decrease in fitness. 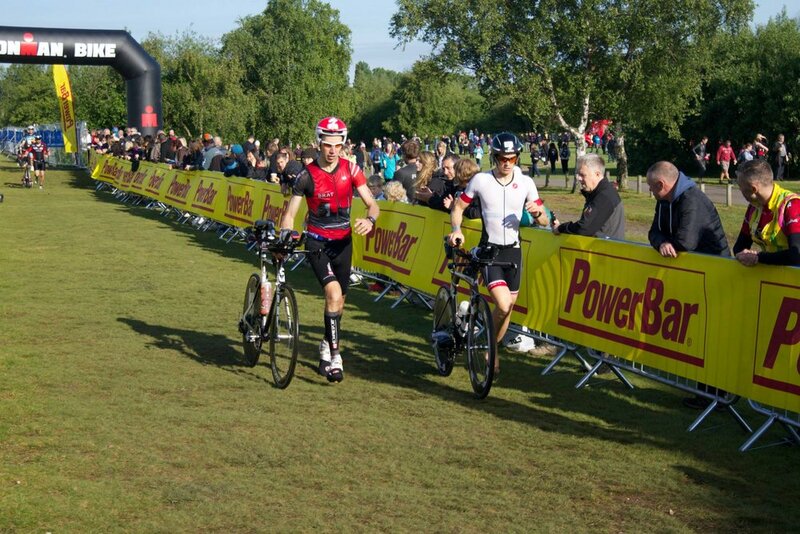 During the race in Chester I tripped after catching someone’s feet. Before I would have looked for reasons why this would derail my race, but on the day I quickly regained focus, relaxing and getting back on track. Taking an objective approach to review training completed showed I was at peak fitness, giving me the confidence that the race was just execution of a the hard work. Philip: Chris became clinical. His focus was on the outcome he needed and as he said, things that didn't go to plan were just 'bits' of information to take forwards. this resulted in a fantastic execution of the race. You were also working with a local S&C therapist called Chris Hands. How did that fit into the overall picture of training? Chris: The winter season was focused on lifting heavy as per a “Stronglifts” routine. Simple compound exercises where I could see small, but consistent increases in weight. Moving into marathon season I transitioned to strength endurance, moving faster but still with weights. Peak marathon training I was high volume running so was doing short plyometrics and core exercises to strengthen my ability to run with good form. Having a S&C coach in Chris I could get instant feedback on technique (and send Phil video’s) and was maximising the gym time and performing exercises with correct form. The last thing I wanted to do was injure myself trying to lift weights incorrectly. Philip: It was great working with Chris (H). He had a really great collaborative approach to performance which meant that we worked off the same plan and were able to share thoughts and observations. I had some eyes on the ground and we both knew that the strength and conditioning work complimented the hard work Chris was doing outside of the gym. You did a lot of cross-training. Were you worried that maybe you hadn't done enough running? Chris: Initially yes, but I actually looked forward to the variety. Running more to run faster wasn't going to help me achieve my goals and was a route to injury. Sunday long rides were social recovery, but still active training, and the swimming was also good not weight-bearing cardio. Having a day off running was great, plus you get to see more of the country when out on your bike. I completed my first 300k ride as well as a 2x250k ride from Birmingham to the west coast of Wales and then back the following day. I definitely wished I had spent more time on the bike for that one! Philip: It is a really fine balance. not many people can run marathons at 2:30 pace and not many of those also fancy doing 90-100km races as well. So the social side of the other sessions added so much more to Chris' training that meant he could focus more on the key workouts we put forwards as running. Yes there were running groups and we used them too. However, those had specific aims. As an "ex"-triathlete, these were fun sessions and certainly not just junk miles, it made him more balanced as a runner and allowed a higher training volume without some of the impact of just running. You run with a Stryd power meter, how does that change your approach to sessions? Chris: l bought the Stryd just as another gadget, but over time I started to use it more effectively. Being able to track fitness / fatigue through power on the TrainingPeaks Performance Management Chart was useful to tie with bike power data to provide information when racing x3 ultra's over 7 weeks. The most valuable use of power was at Comrades (90km road race with 2000m climbing and 1500m of descending throughout). I was able to keep a consistent HR and power output on the climbs. As I passed people who had clearly started too hard, I'm sure that the longer the race, and the better you understand your numbers the more effective it will be for both training and racing. Philip: As mentioned in the blog here: power can be a useful friend in long distance run training. I think that it is really interesting that Chris finds it more useful as he went longer. The tricky thing is that you have two questions: I want to break 2:30 therefore I must run 3:33/km. That is a desired output. The other side of it is what can I sustain (Ie power) for 2:30. If you run 2:33 at a power greater than what you can sustain for 2:30hrs, then you will blow up. If you run the power, then the pace, you have the best chance of succeeding. Chris' training let us know what these input values could be to give him the best possible chance of succeeding with his goals. Furthermore, as Chris says, when you go even longer it ensure you don't blow up by going unsustainably hard up the hills! 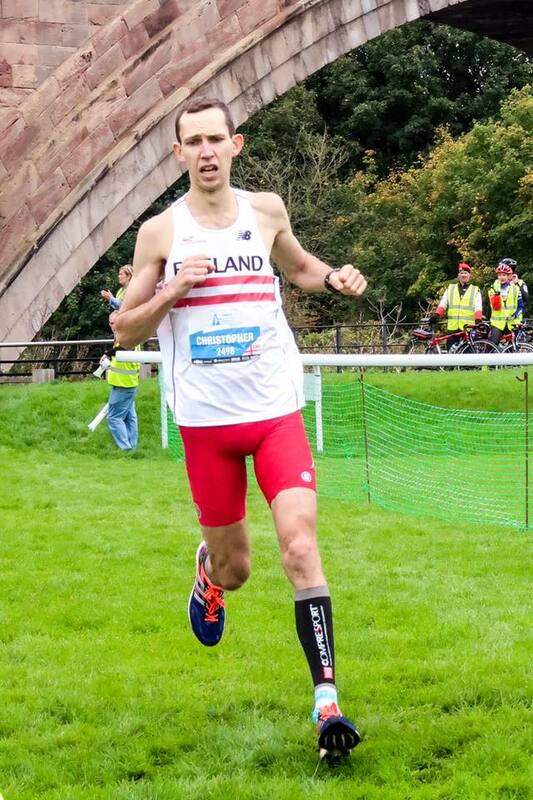 What were your big worries going into the first half of the seasons races (ultras) v the Chester Marathon? Chris: Comrades was my only ultra in 2016. So doing multiple ultras in 2017 my concern was the potential for injury and overtraining. I very much looked at the Malvern Hills 50, and the UK National 100k Championships as training races for Comrades. I think it is the equivalent of a 70.3 to full Ironman. Suddenly it becomes more about fuelling than about fitness. Some of the more "mature" athletes were settling in for their 100mile races and looked far stronger than I could ever be. Again, another example of nutrition and mental toughness counting for so much. Chester marathon the biggest concern was the weight of expectation. Having been so close in 2016 (2:30:25 at Frankfurt) I knew that I had the potential, but needed to execute. It was great having my family their, but also developed internal pressure to deliver. Thankfully I achieved my goal (2:29:01) so they were able to celebrate my success, knowing how much work I had put in over the year. Philip: There are three factors to Chris' pressure: Internal, external and training input. Clearly we could control the internal dialogue and also demonstrate training successes. However, the impact of third party that weight of expectation is hard to shake off. Mark really helped to put everything into perspective and use this pressure overshadowing him, let him turn this into an opportunity – which we think he did ok at! What were your biggest learning points from this season? Chris: Firstly training will only get you so far. For those starting out, I think there is loads to be gained from just running more, and increasing fitness but after a while you need to explore other avenues an opportunities. Don't forget sleep either. As Jason Walkley said in his blog, juggling life and training can be a balance, bad sleep will only result in poor training, sometimes rest is better than flogging yourself through a poor session. Secondly, there will be set backs. You may get injured, life may get busy, you may have to take a holiday in the middle of marathon build up. Don't stress. As long as your overall plan can keep going you will be fine. I lost 4 weeks training prior to Manchester marathon, had a quick sulk and then got my focus back through cross training. It wasn't ideal, but I managed to get a good result despite the lost training time. Finally, training with others can be a great way to develop. This can be about having others to run with, or just about picking the brains of those around you. Working from home I have the advantage of being flexible on my running schedule, but running hard intervals with others is much easier than doing it solo. Being coached by Phil we were able to make some of my sessions work with the BRAT Club so I could train with others, very useful when you have a 2 hour run to complete as it goes much quicker when running with others. I would say that overall I discovered that I am really starting to realise my potential. Some of the things I did this year I never thought would have been possible. I am proud of what I have achieved, but also grateful for all those who supported me on my journey. Philip: Can't put it better myself. Well done on a brilliant assault of the 2017 season, achieving some very lofty goals but most importantly learning so much more about yourself which will only add to you for next year.